Carbon dioxide (CO2), emitted by fossil fuel combustion and other human activities, is the most significant greenhouse gas contributing to climate change. Scientists with ESRL’s Global Monitoring Division keep track of CO2 and other greenhouse gases in the atmosphere in two ways. First, the group coordinates an international cooperative flask sampling network in which scientists and volunteers at more than 60 sites around the world collect air samples weekly, shipping them back to Colorado for detailed laboratory analysis. Secondly, the group maintains six baseline observatories around the world, where staff collect flasks for analysis and also measure CO2 continuously, along with many other aspects of the atmosphere and solar radiation. 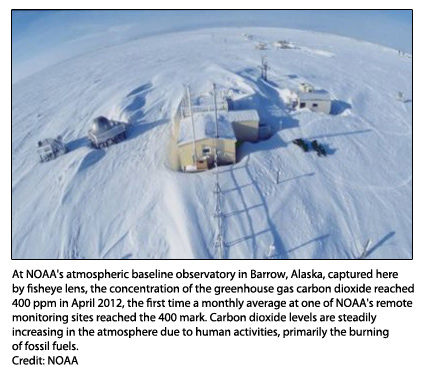 In Barrow, Alaska, the only remote northern site with continual CO2 monitoring, the average monthly value of CO2 reached 400.00 ppm for the first time in April. 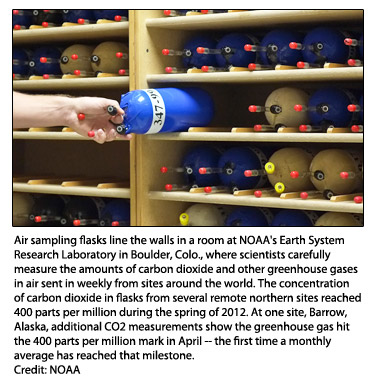 Flask measurements made at Barrow and other remote northern sites from the North Pacific to Norway also showed CO2 levels periodically reaching 400 this spring.